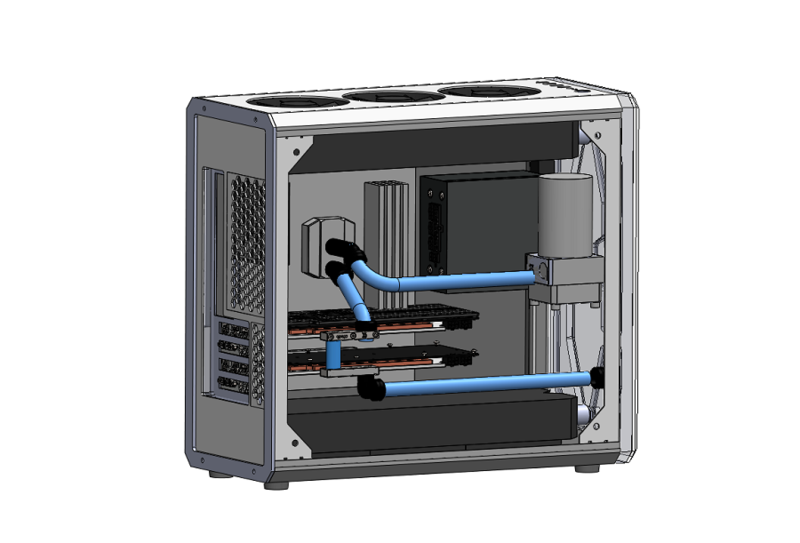 Here is the next system I am planning to build an enclosure from scratch. I want to cram in loads of water cooling capacity so I can really push the overclocking. While keeping the size down to a minimum. At 47 cm tall this is close to a mid tower size. Even with Aluminium and carbon fibre construction it is going to be heavy hence the high density title. GPU: 2 x What I can get my hands on. 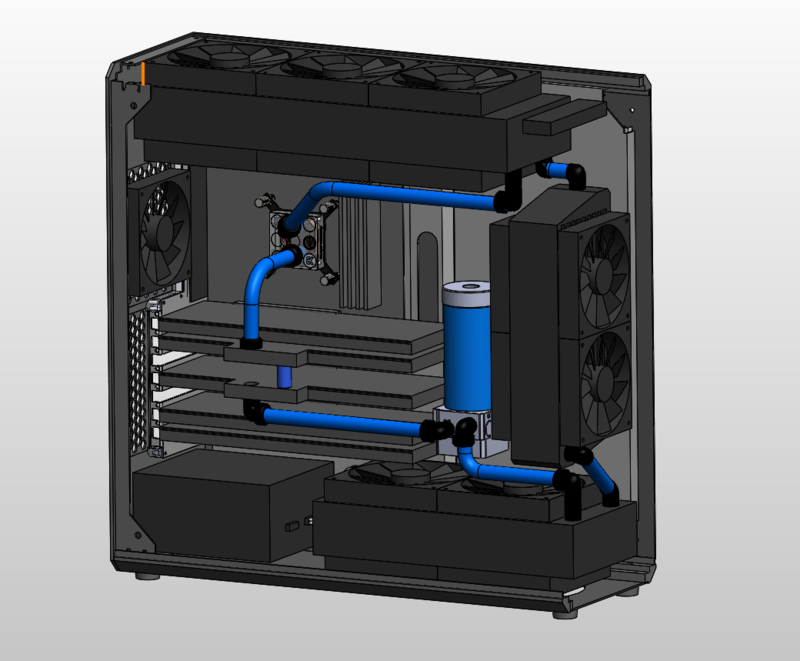 1) Front Mount 280 x 60 radiator with 4x140 fans in push pull layout. Draw cool air in form the front. Cooling the CPU. 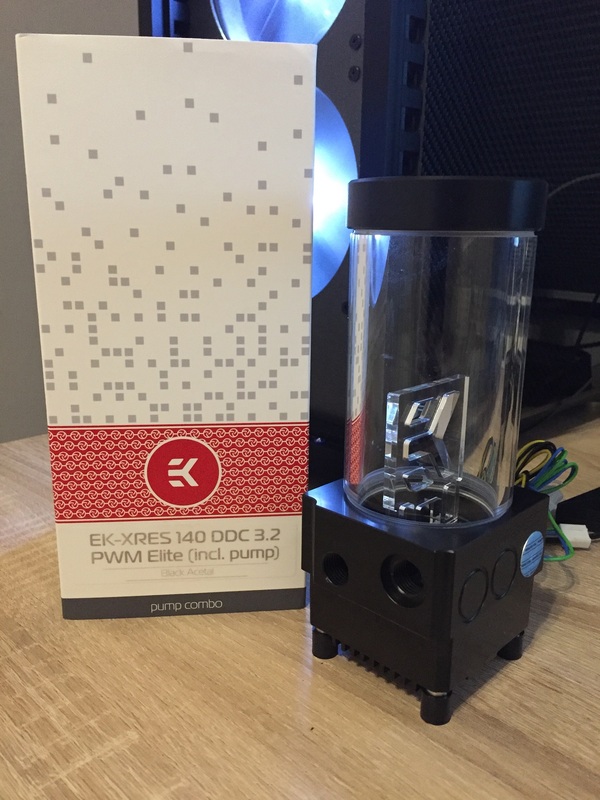 Pump and Reservoir EK-XRES 140 REVO D5 PWM. 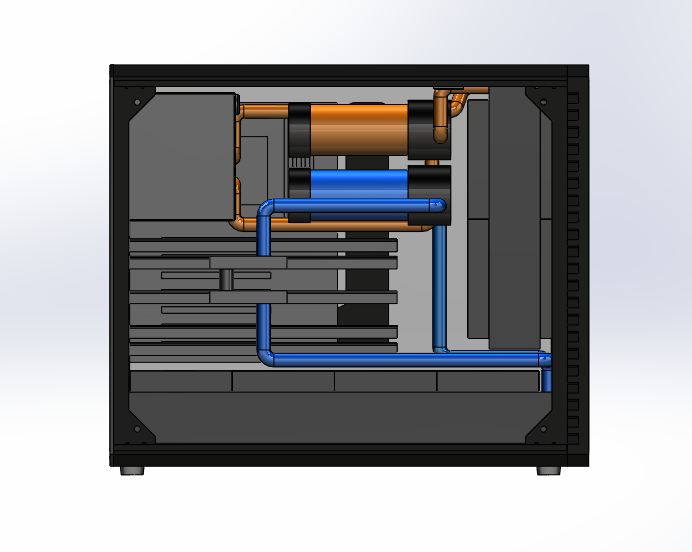 2) Bottom mounted 480 x 60 radiator with 8 x 120 mm fans in push pull layout Draw cool air in from bottom. Cooling 2xGTX TBD. Same Pump and Reservoir EK-XRES 140 REVO D5 PWM. 4) Power Supply moved to cover the motherboard where the rear fan would normally be. Aesthetics will suffer but I am really trying to stay away from full tower form factors. I'll add a second poll if I can. 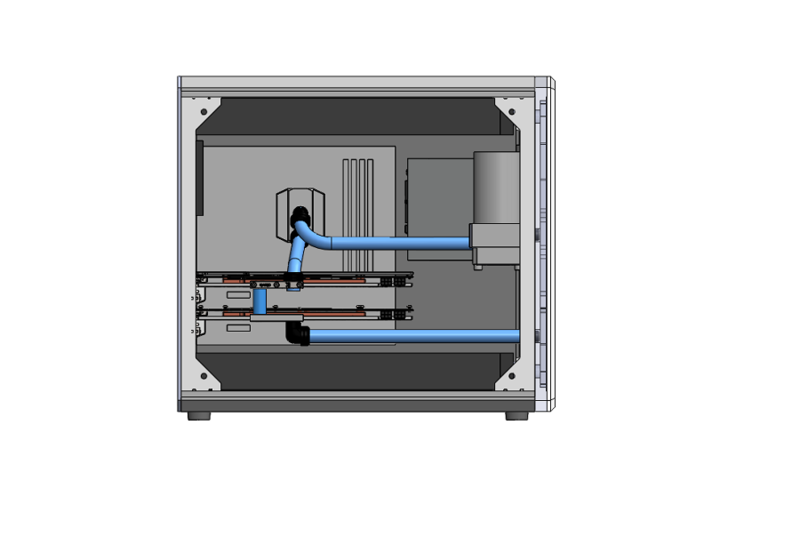 Should I have a vent in the side panel so the PSU can draw in cool air? 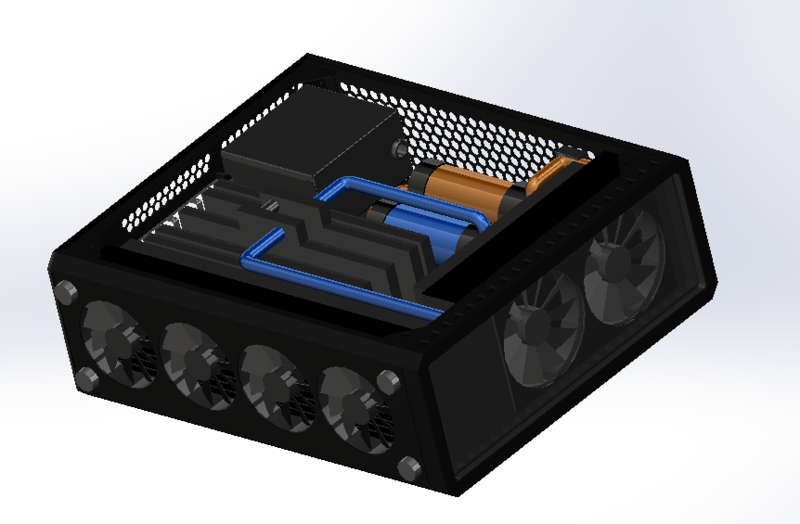 Or should I have the PSU face the MOSFET heat sink to draw more air over that area. 5) Are 60 mm radiators an overkill?. Would it be better with 45 or 30 mm thick and a smaller enclosure? 6) Blue and Orange accent colour scheme for coolant and cable sleeving since they are complimentary. I can see wiring giving you trouble with everything packed in that tight. My current build is tight like that, and it's all wire. The reservoir close over the power plug gave me some trouble even with Seasonic flat cables. You should probably draw this with stock 90 degree fitting clearance just in case. 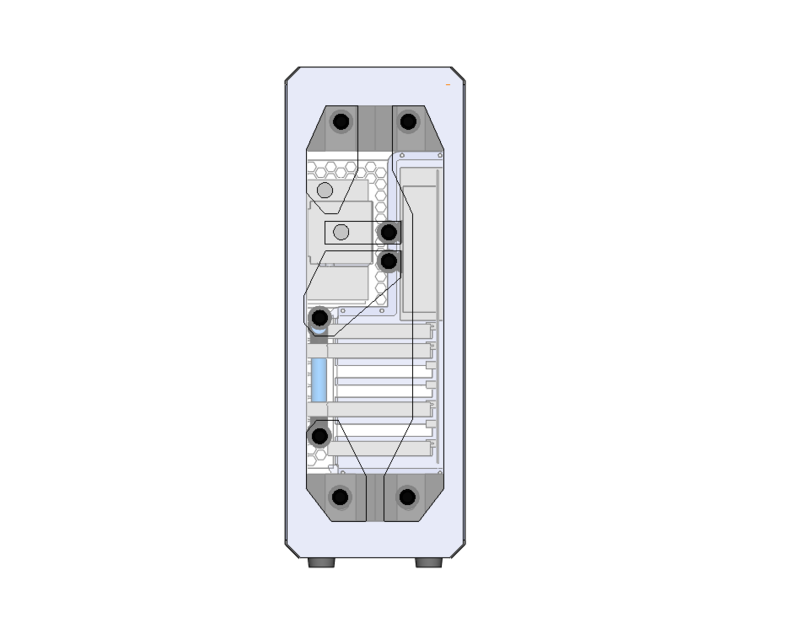 4) The psu will probably get plenty of air with that much fan pressure. 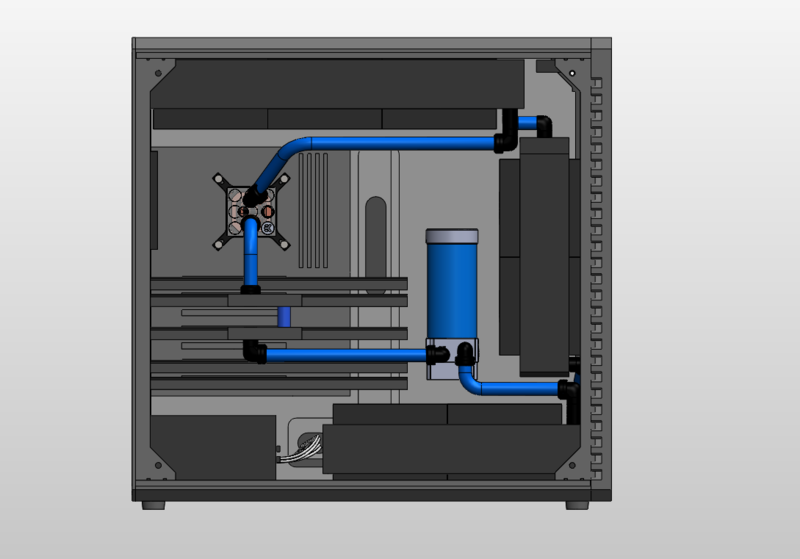 Following Cheapskate's suggestion I started to lay out the cooling lines and cables in more detail but could not find CAD for all the Bitspower fittings I needed. So here is a set of what I think are some useful parts for hard line cooling. 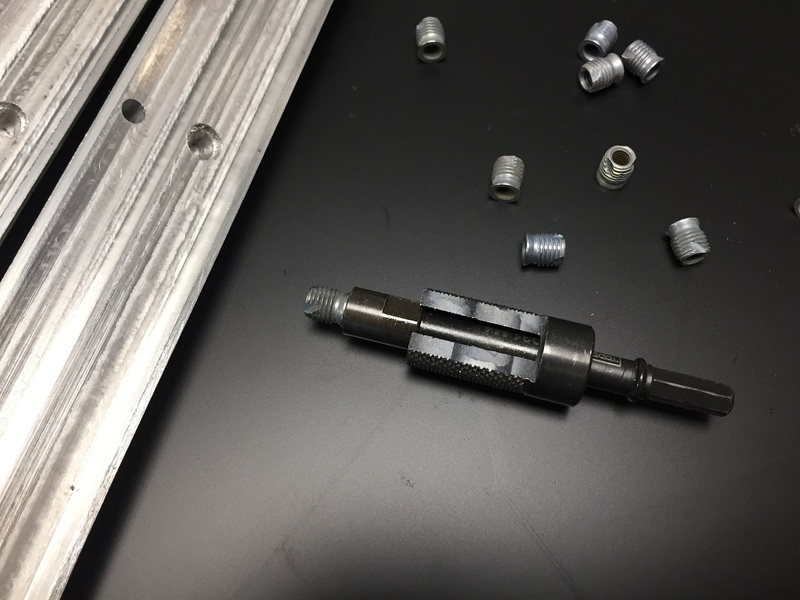 These can also be used as building blocks for some of the dual and quad rotary parts as well. 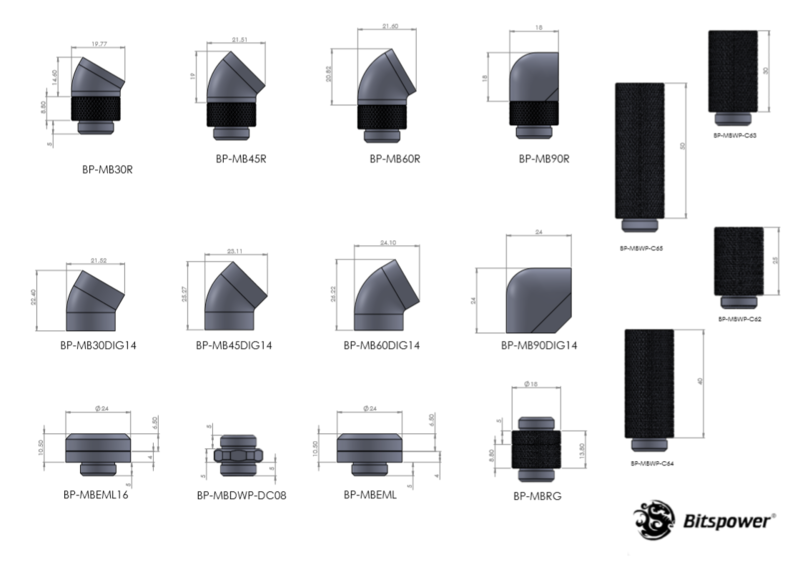 You can download at Grabcad https://grabcad.com/library/bitspower-g1-4-fittings-0-30-45-60-90-1 . G1/4" fittings, 0°,30°,45°,60°,90° - 12 or 16 mm hard tubing. These are modelled form drawings in Bitspower online catalogue. They are simplified version of the actual parts and may contain slight inaccuracies. Some files have knurling removed to keep file size down. 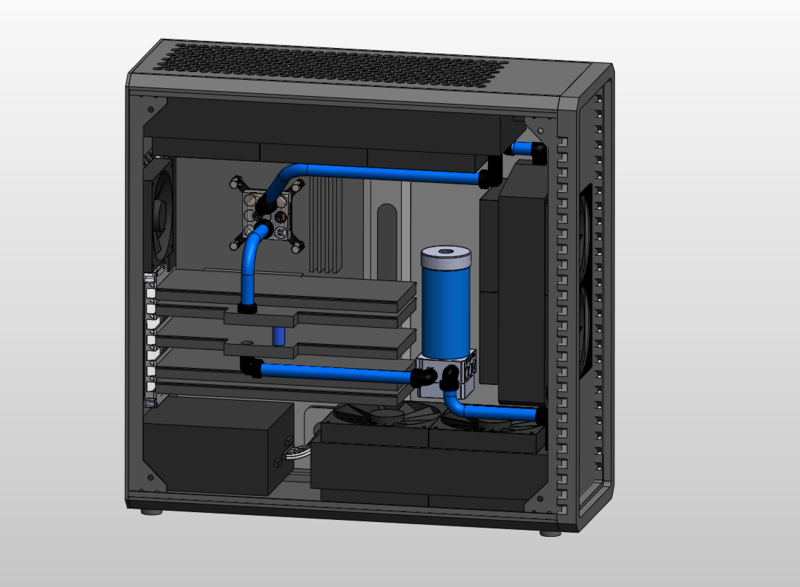 I have updated the CAD to add in Bitspower fittings hard lines and power cable space. Moved the power supply back to the bottom. Two of the tubes to connect the front rad may have to be soft. I will drain from the bottom rad out the front of the enclosure. Front intake 60 mm thick 240 cross flow with push pull 4x120 mm fans. I was looking at a 400 radiator with 2-4x200 mm fans at the top but is seems like the fans don't have as good pressure specs as the 140 fans. To be honest, I was feeling the first concept a lot more than the second one. 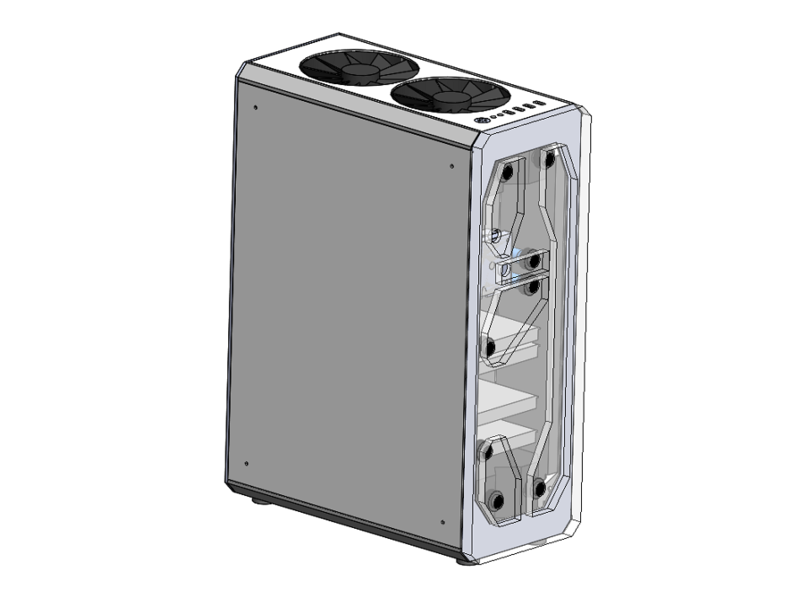 You say you want to avoid full tower form factors, but it seems a lot of effort has gone into designing something you can already buy from Phanteks or BeQuiet. 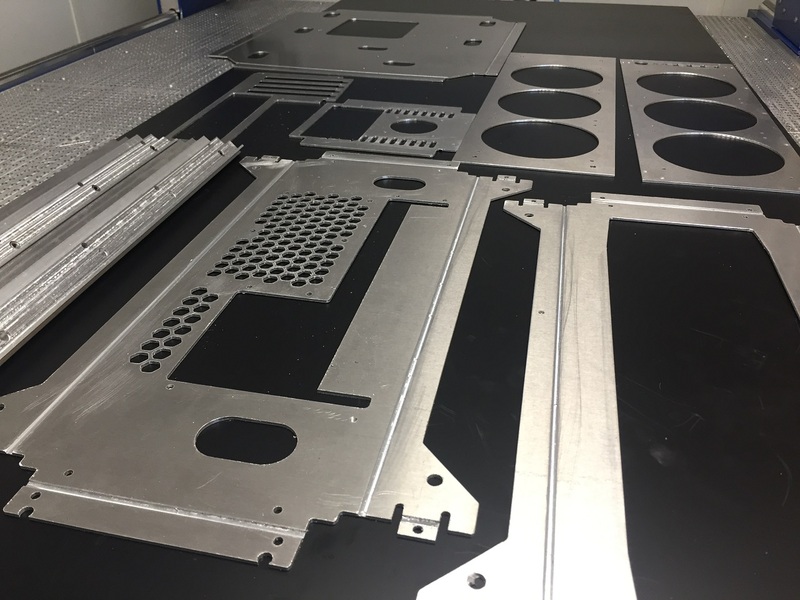 Is your hardware list fixed or just in the planning stages? 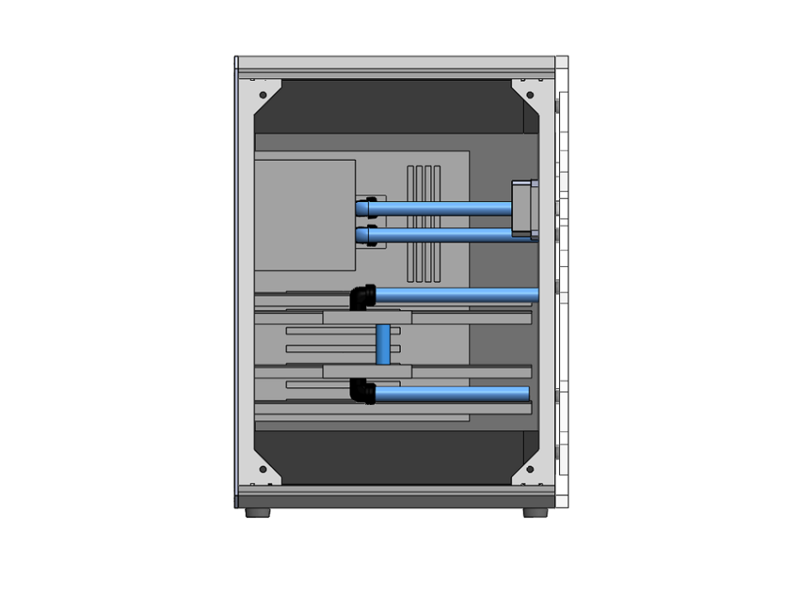 Are you building this enclosure purely for this system or for future uses? You say you want to keep the size down, yet you've gone full ATX support with 8 slots, a full-sized power supply and 60mm thick radiators. These components are not conducive to keeping the size down. 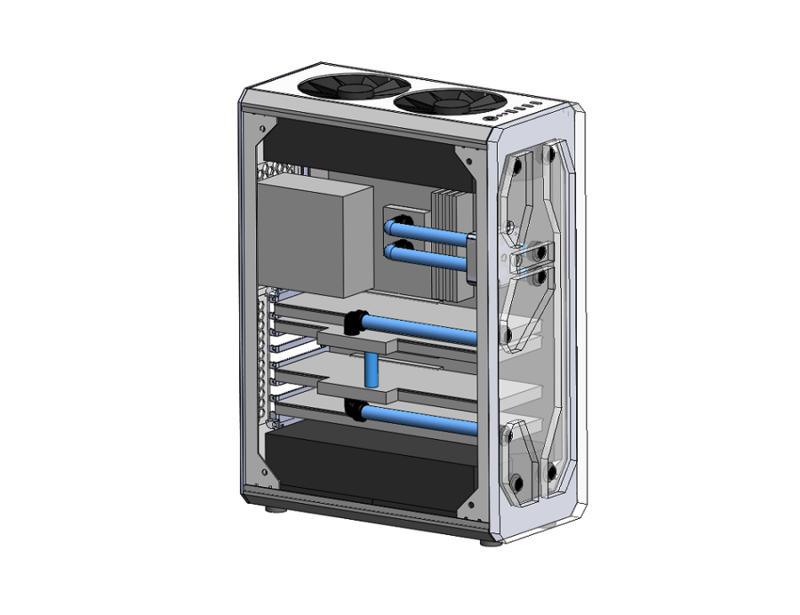 Personally I'd go back to a 4x120x30 rad in the bottom, mounted on its side for a crossflow design, change to a SFX-L power supply and either put that in the front so you're not obscuring the motherboard, or down the bottom with the rad. Stick with a single loop, downsize to a mATX motherboard as your spec isn't doing anything with all 8 ATX slots, and that means you could even keep the 2x120 rad in the front (with the PSU down the bottom) if you wanted. @LePhuronn -I think making more options for his custom shop is what this is about. I suspect there will be quite a few more layouts coming. I got a bit worried about the first layout being unapealing to most people due to having the power supply cover the motherboard and CPU as well as fitting it arround the hard line cooling to the CPU block. I’ll rearrange it again and look at an SFX L PSU in different locations. 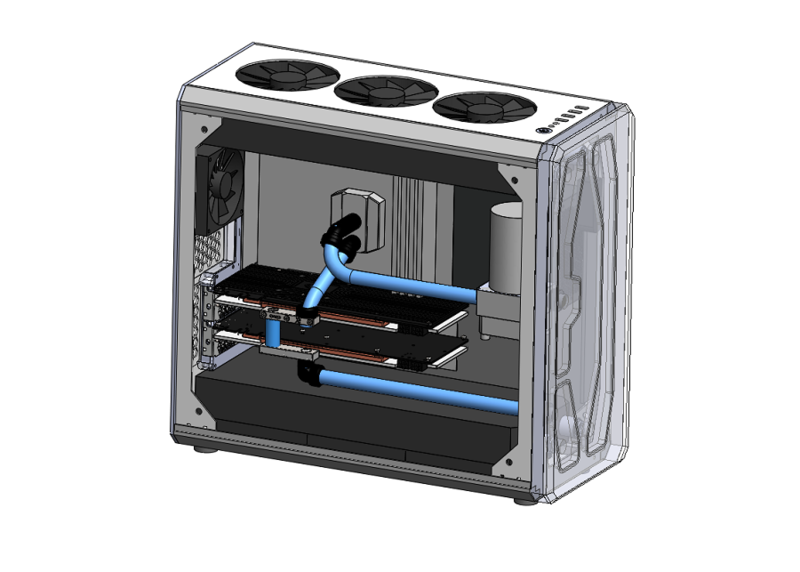 My first goal is to build a case for an interesting water cooled system that can not be built using an off the shelf enclosure to demonstrate what I can build. Second goal is for it to be roughly mid tower size because it is my personal gaming system. If it gets too small I feel like high power density will make it louder than I like and a large full tower takes up too much space on my desk. So cramming in more radiator capacity than a normal mid tower I will hopefully be able to run the fans slow and quiet. I modeled in the 60 mm rads but was also planning to test 30mm rads with shrouds to see if the lower pressure drops would make for a quieter overall system. Most of the components I have already except the rads, fans and graphics cards but I could get another motherboard or power supply if it seemed compelling. I like the full size ATX motherboard just incase I want to add extra stuff in the future like storage. For the GPU I have one GTX 980 at present and may just get a seccond one off eBay if we don’t see the 1180 soon. I’ll post new CAD pics again later in the week. From my limited experience, the noise of the system isn't really going to be affected by the size of the case. 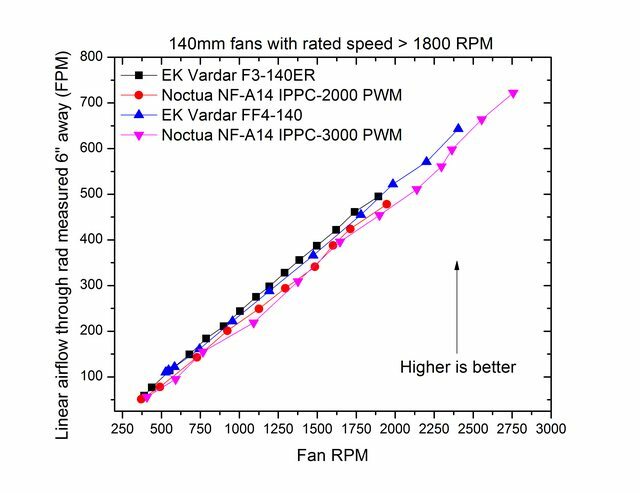 A fast fan is a fast fan, regardless of how big a box it's put into, so we're talking more radiator space and turning fans down low. That being said, you can have too much of a good thing and just arbitrarily smashing loads of radiators at the thing is likely to be counterproductive. Your 2nd design is rocking 15 fans and I'd wager that getting all of those spinning low enough to not be noisy would mean there's no grunt at all to actually flow air over the radiators. Sticking with what you have then, 4x120 across the entire top, 3x120 in the front and bin off push-pull entirely. 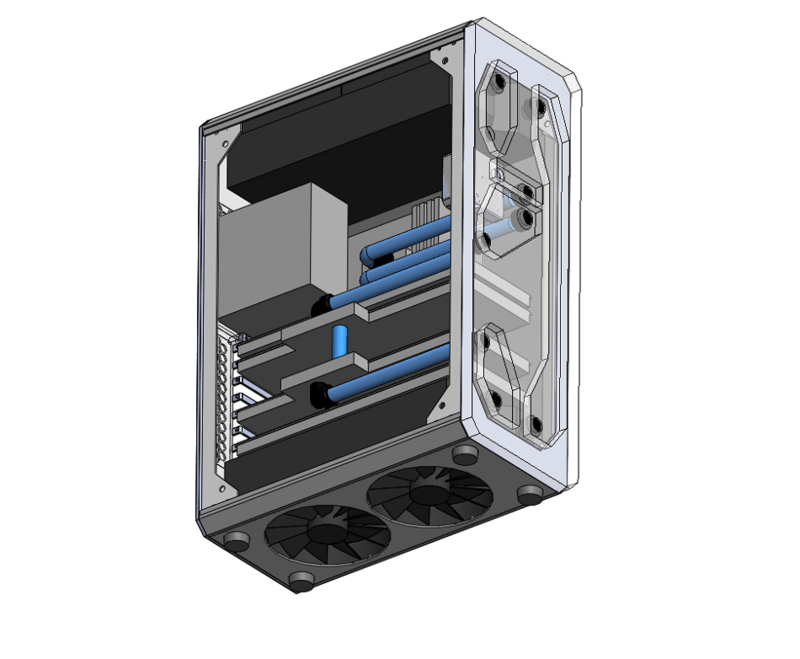 PSU can go in the bottom and you have a nice little space between the PSU and front rad for your pump/res assembly, controller boards like an Aquaero or similar. 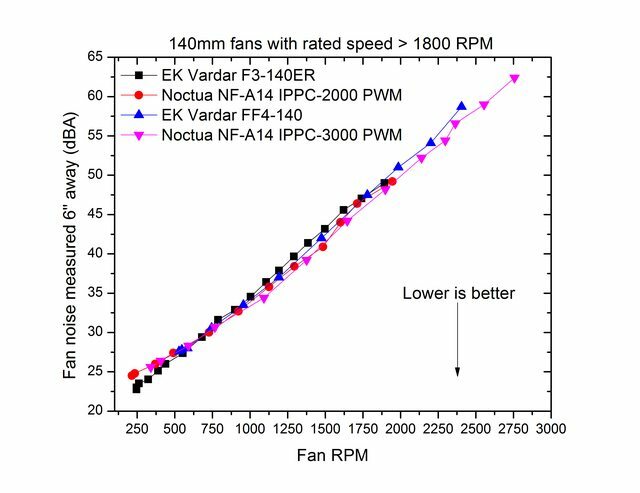 If you double a fan speed form 750 rpm to 1500 rpm you get 30 dbA to 38 dbA (using the best Noctua Fan in attached graph) for a much higher sound level than just adding a fan. Having said that i am still pulling fans and radiators out to make it look nice ! I really like the SFX L PSU back above the motherboard. Leaving the top and bottom for cooling. They are both 280's since they match the full length PCI cards well. 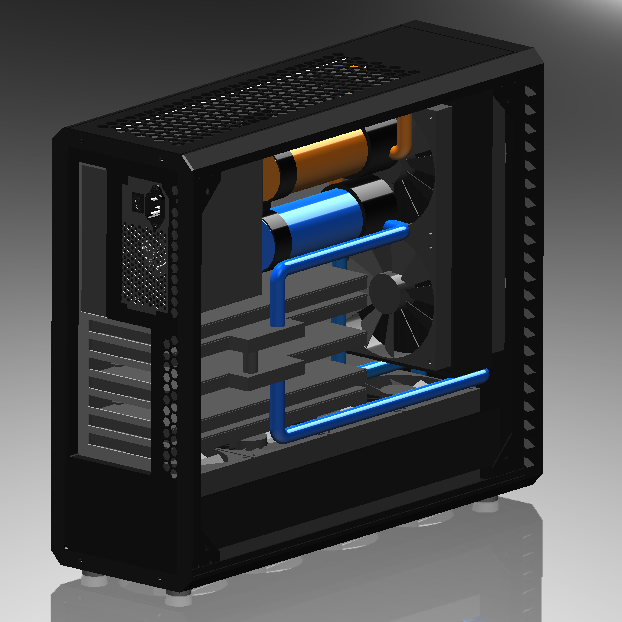 I have modelled 60 mm thick with one set of fans each but could also fit 45 thick rads in push pull. This setup got me thinking about a clear distributor plate on the front. There should be less noise projected out the front of the enclosure at my ears . 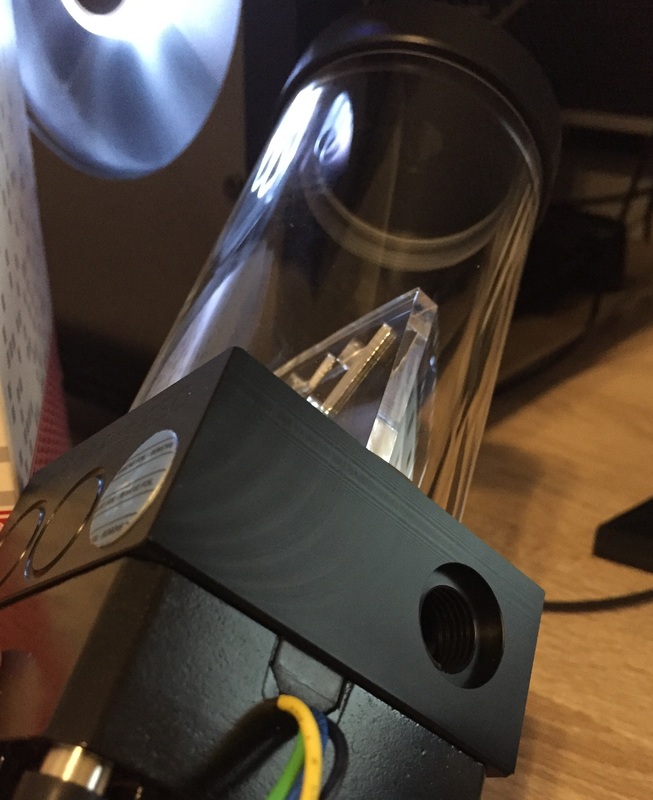 Although I am a bit concerned about the pump mounted on the inside front of the enclosure. No reservoir anymore. 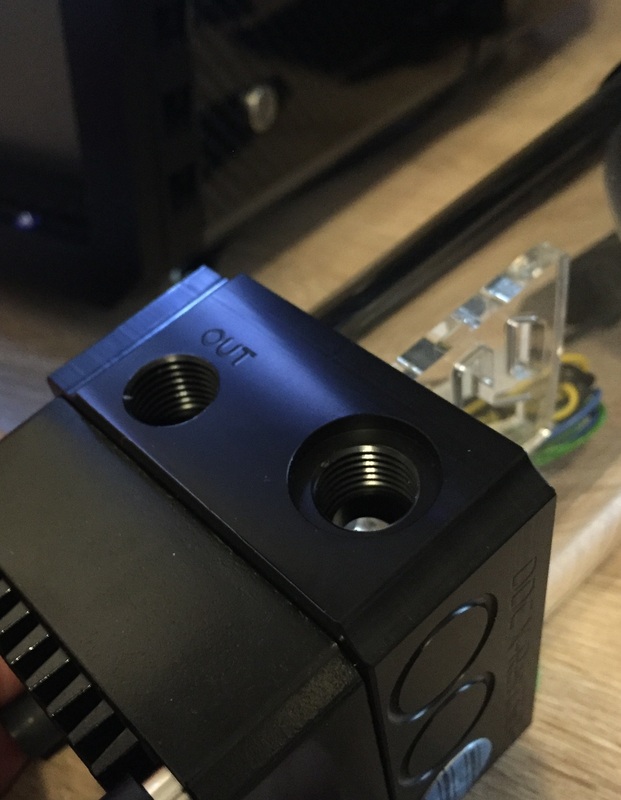 I might have to make my own custom fittings to attach the rads to the distributor plate that bolt from the outside with large flange and O ring seal to the flat face of the acrylic. 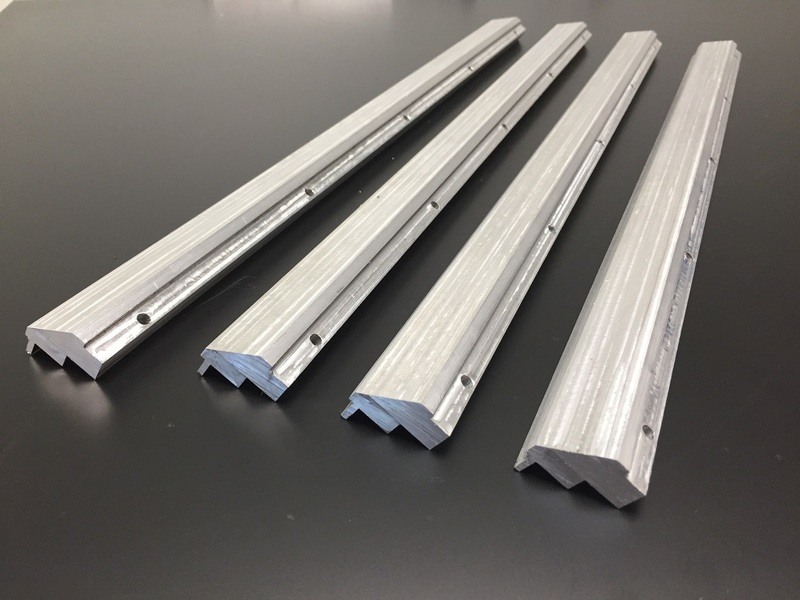 This will overcome problems of access and also CTE mismatch of the brass and acrylic. Filling should be really easy with two ports at the back in the ends of the radiators with the whole system placed face down. Liking the new renders. 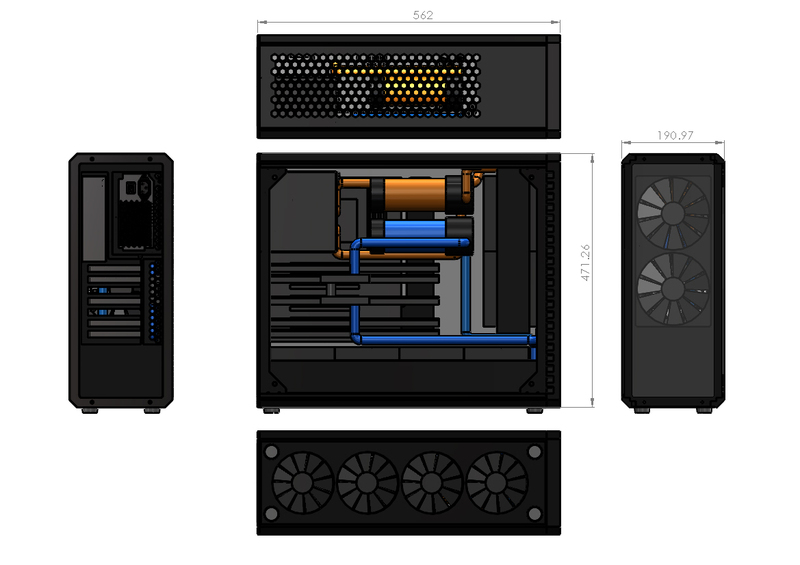 How about extending the length to upgrade to a triple rad at the top and using the extra space to get the SFX-L PSU down the bottom? Although as you've shown, having such a smaller PSU over the motherboard doesn't obscure much. It will make it extremely difficult to wire it neatly, though. Updated again to improve cabling. Switched to 360 by 45 rads in the top and bottom with the SFX-L power supply at the front behind the pump. Will need a right angle AC power cord running internally. will find space on the rear to run it out. I plan to make some custom short sleeved cables for it. There is still room for the longest graphics cards. Also finally followed LePhuronn's advice and changed to Micro ATX motherboard as the box was too tall. looking good. 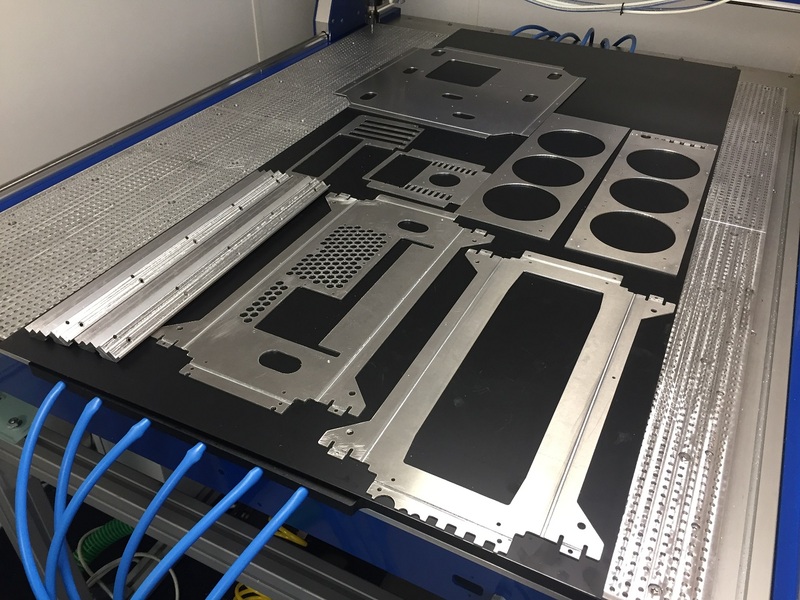 I actually deleted a comment about making manifold plates because I couldn't see a way to make it practical with your previous layout. PSU space may be too tight. My last build had 23mm between the PSU and motherboard. The ribbon cables had to be jammed in gaps because I underestimated the amount of space the connectors needed. Although I'm not sure what's going on with your DDC assembly. 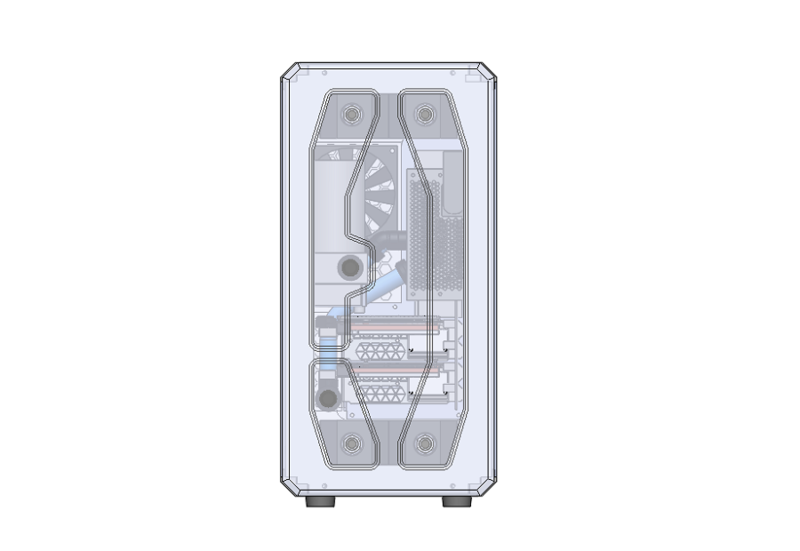 You have a res on it, but the pump top seems to be connected to both the distribution plate and the CPU. 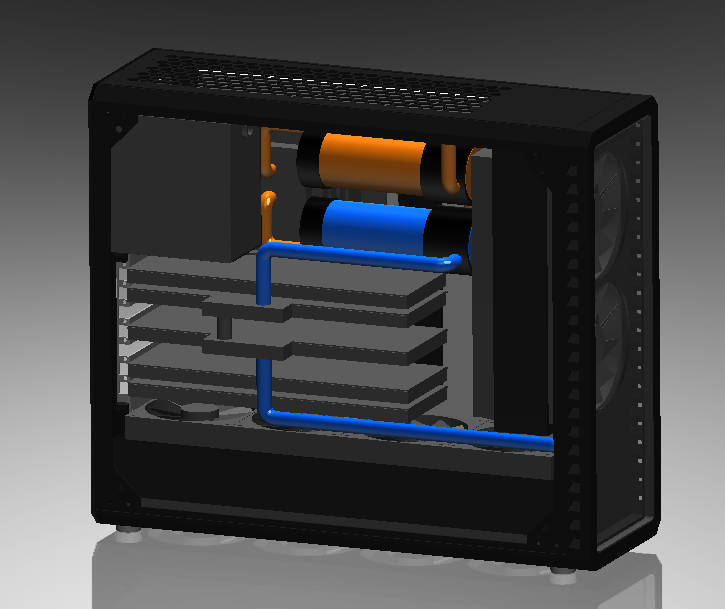 It is an EK-XRES DDC Pump and Res. In and Out can be on opposite sides of the pump top. In the current layout IN is from the distribution plate. OUT goes to the CUP block. I need to change the Res to a shorter one though. Those swines at EK! If only they did the same for the standard DDC top I would have avoided many headaches! 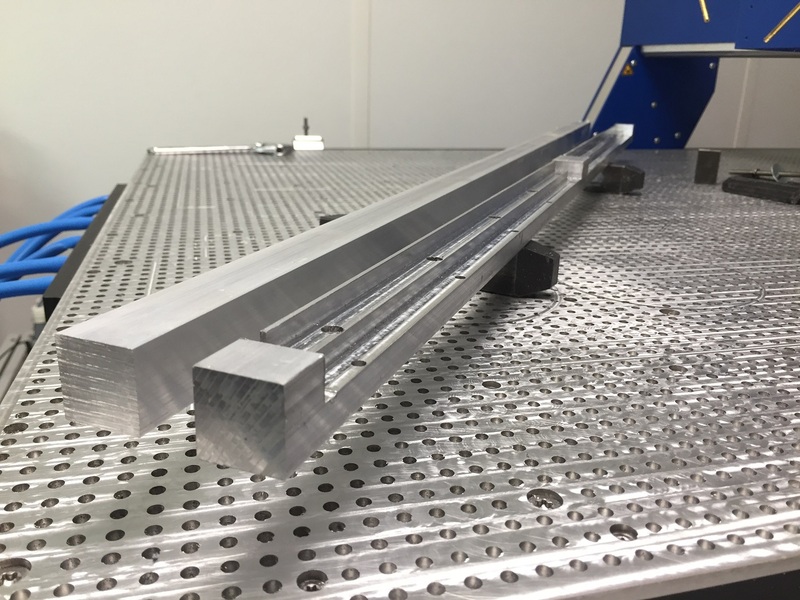 Started machining the corner extrusions yesterday and today. They are longer than previous parts I have made at 439 mm. Any longer and I would not be able to fit two parts per extrusion. 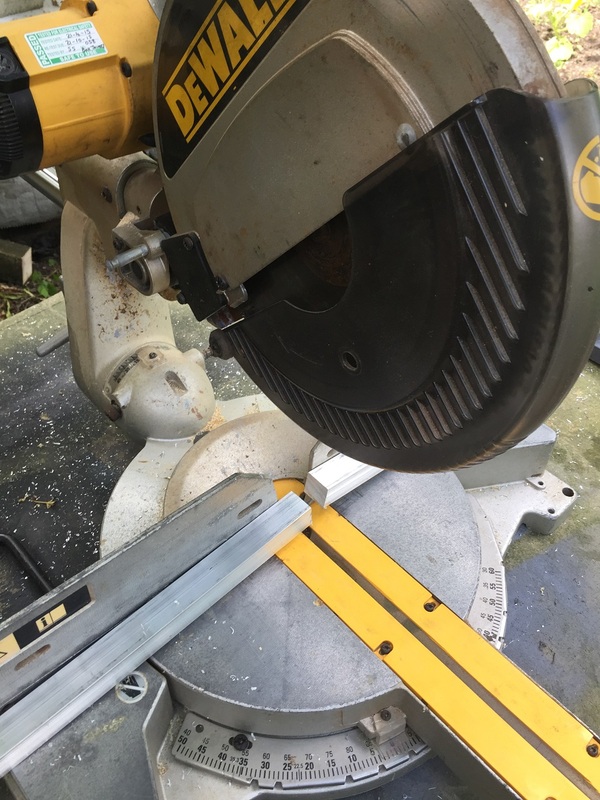 Cut 1" Aluminium bar stock to 1 m length on the chop saw. Setup and machined on the Stoney CNC router. Used two different cutters. 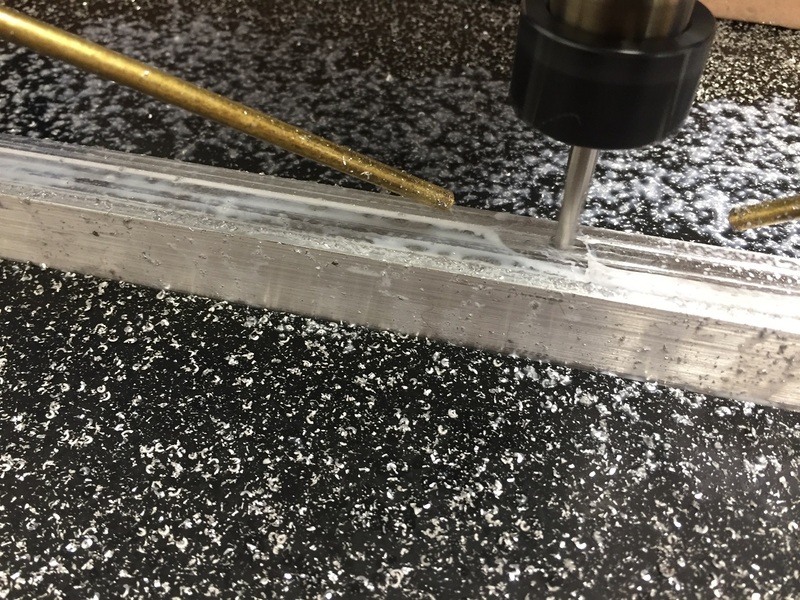 6 mm to remove the bulk of the material and 3 mm for small holes. This is just the first side but it takes the longest. Bottom side and the chamfer will be next but they have less material to remove. 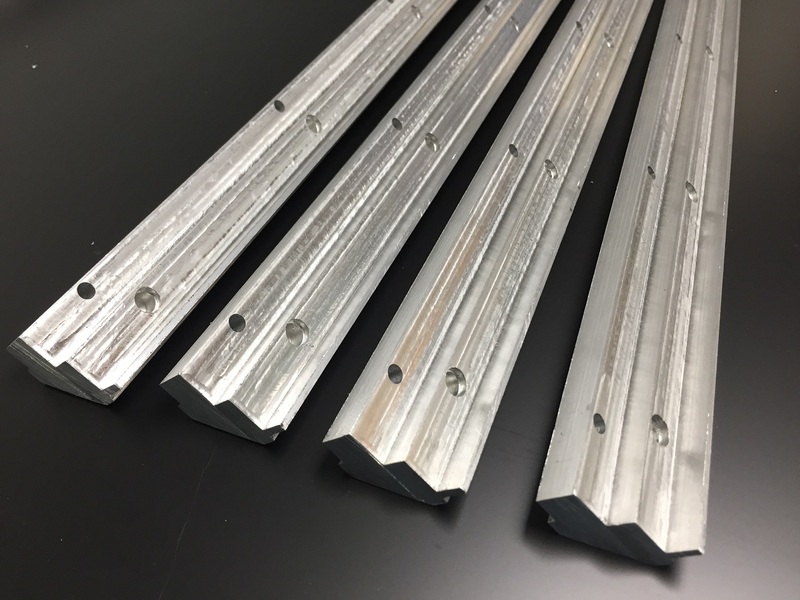 Corner extrusions are are finished. Ready to install M4 Tappex inserts. Ah, loving the inserts. Currently on a 1mm M3 self-clinching flush nut kick myself. 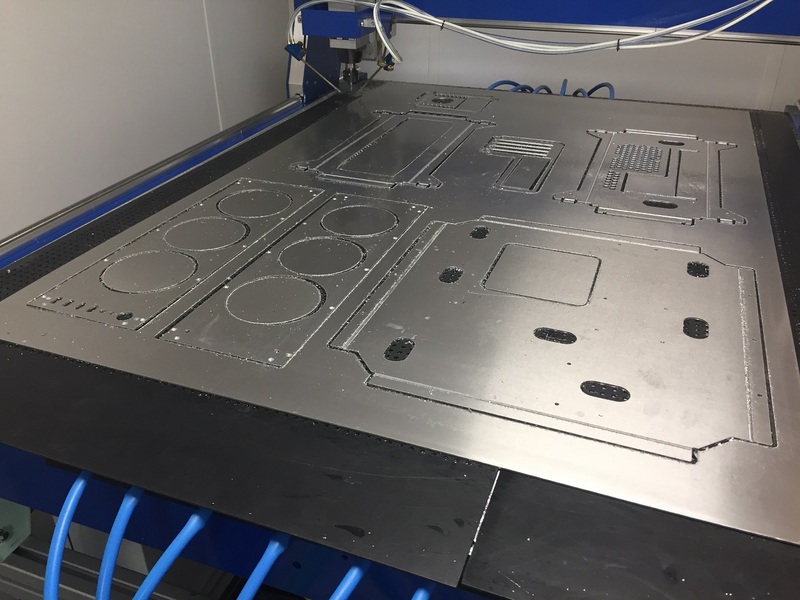 Cut a set of the main structural sheet metal parts on my Stoney CNC router and cleaned them up today. There is a mistake in the PCI/ IO Frame as I programmed it to cut on the outside of the line for the motherboard fence hole instead of inside the line. Will have to remake that part at some point after I fit check everything.